Hyoliths remain enigmatic, conically-shelled fossils whose remains span sedimentary deposits of the Paleozoic Era. They were most abundant and diverse during the Cambrian, after which they declined progressively until their final extinction in the Permian period. So, by lower Devonian time they remained extant, but were not so common. Though common as fossils, hyolith origins and internal morphology remain virtually unknown. 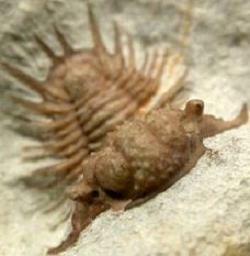 They were most likely benthic animals, meaning they lived on the sea floor surface. Their calcareous shells had a cover, or operculum, and two curved supports known as helens. Most are one to four centimeters in length and triangular or elliptical in cross section. Some species have rings or stripes. More information on these creatures can be found in Wikipedia. 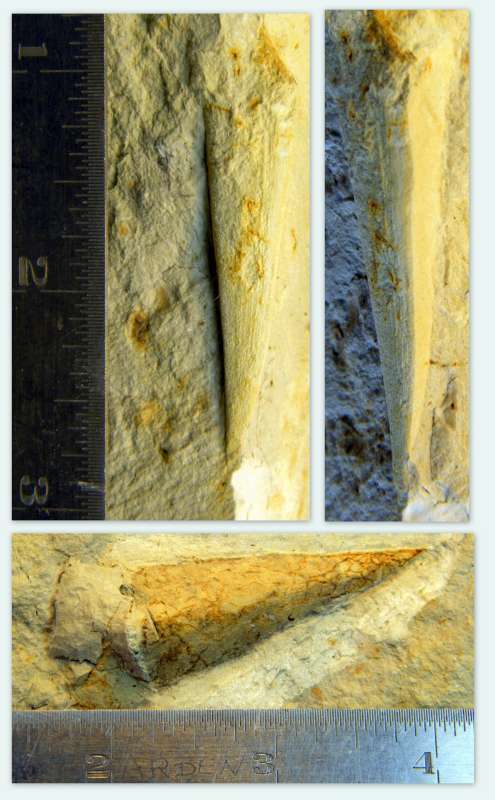 The original cuticle of the following hyolith appears to have dissolved, but it left fine details of its surface structure, as one will notice toward the top of the specimen where fine vertical striations can be seen. Also, a number of epibiont remains are scattered on the surface, and might is be possible that the iron oxide stains are the traces of scavenger trails? No evidence of the operculum or helens remain. The hyolith shown above appears to have been elliptical in cross section. 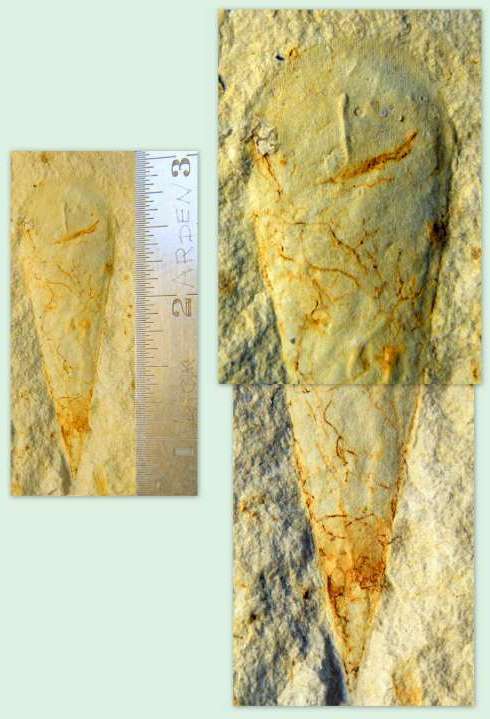 The following two examples, found by Bob Carroll and Bill Rushlau at Black Cat Mountain show a gently sigmoidal axial curvature, with triangular to elliptical cross section (top two images of same specimen, different views) and triangular cross (lower image, oriented horizontally). The upper specimen exhibits longitudinal strips. The lower specimen appears to have few surface features, other than the meandering iron oxide filaments of scavenger residue trails.